Inspiring travel adventures for foodies, families, and fun seekers! The glacial Lake Bohinj (Bohinjsko Jezerko) has always been a draw to us from the minute we arrived in Ljubljana. It is only a 1.5 hour drive from the capital and yet feels worlds away. 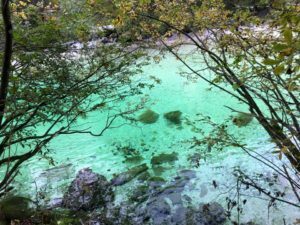 I would characterize it as the most easily accessible exotic destination in Slovenia. This lake is nestled in the Julien Alps and is the largest permanent lake in Slovenia. There are many ways to enjoy your time in Bohinj. If it is summertime, you can find a pebble beach along the shore and camp out for the day. Since the lake is surrounded by forest, you will have no trouble finding natural shade and a nice soft grassy patch to soak in the views. With a hiking trail that encircles the entire lake, you can choose whether you want a more popular beach spot or a more private secluded one for yourself. 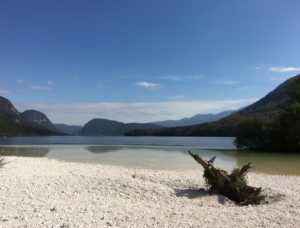 While Lake Bohinj is deep, the shores provide gradual entry for wading in the water. Be forewarned, however, this is a glacial lake, meaning it is ALWAYS COLD!!!!! No matter how hot it is outside you will blink hard, shake your head, and let out of shocking sigh when you first jump in. I promise you though, there is no feeling so fresh! On the more populated side of the lake, by the town of Ribčev Laz you can find shops to rent stand up paddle boards (SUPs), kayaks, canoes, or enjoy a serene non-motorized pontoon boat ride around the lake. This side of the lake is also home to several cute cafés on the water where you can enjoy an ice cream or coffee, we well as several restaurants. If you are super duper adventurous you can also go paragliding over the alpine slopes surrounding Bohinj and land on the Ribčev Laz side of the lake. Vogel – Take the 5 minute cable car up 1537 m (5042 ft) to enjoy some incredible aerial views of Bohinj on your way to several great hiking options at the top. If you are traveling in the winter, Vogel is a ski resort. The cable car starting point is only a 10-minute walk from the town of Ukanc and has a dedicated parking lot if you are driving. 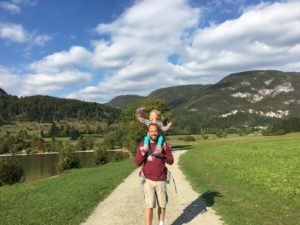 Hike around Bohinj – There is a great and mostly flat path around the entire lake. It takes about 3 hours to hike completely around the lake, or if you prefer, you can hike only half of the lake from Ukanc to Ribčev Laz and take a pontoon boat back to where you started…of course after enjoying a little coffee break by the lake. 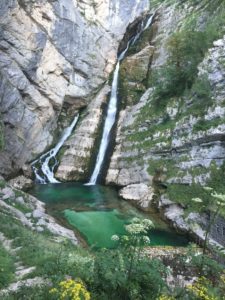 Hike to Slap Savica – This waterfall is one of the main sources of water for Lake Bohinj and can be easily hiked to for great views of the lake and the waterfall itself. If you hike from the Ukanc side of the lake, it is about 4 km and takes about 1.5 hours to get to the waterfall. If you do not have time or energy, you can also drive to Savic Lodge and walk from there. It is only a 15-minute walk from the lodge to the waterfall. 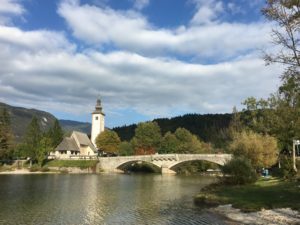 If you are looking for a spectacular place to eat, I recommend a pit stop at the restaurant Pri Hrvatu in the town of Srednja Vas v Bohinj. It is about a 15-minute detour on the drive from Bled to Bohinj but well worth it. The views are SPECTACULAR, the local traditional dishes even more, it has a great staff, and even a selection of local craft beers. Just look at this view! 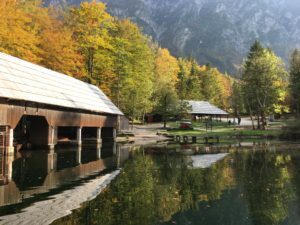 While it is only a 1.5 hour drive from Ljubljana to Bohinj, given all there is to do, even just around Bohinj, you would really do yourself a disservice if you did not stay even for just one night. 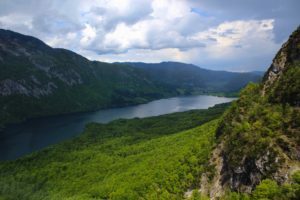 The Ribčev Laz side of the lake provides more of a surrounding little town with restaurants and boat rental options while the Ukanc side of the lake feels more isolated and is a good jumping off point for more hikes. 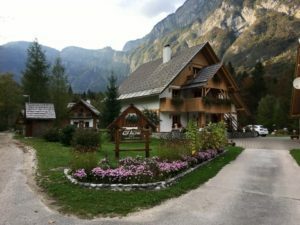 If you are not opting to go the campground route, there are several adorable alpine apartments you can rent. In this area, most property owners post on Booking and Airbnb. We ended up staying at Apartmaji Alpik. The owner has done a great job with the atmosphere and amenities and it is a great spot with good proximity to the main restaurant in town and the lake and hiking. If you are traveling with kids, the easy hikes are doable, whether you are sporting a carriers or those little legs are working on their own. For lodging, I definitely recommend picking a spot near a restaurant and if you have to make a grocery run note that the last spot to pick up groceries is the Mercator (supermarket’s name) in Ribčev Laz. 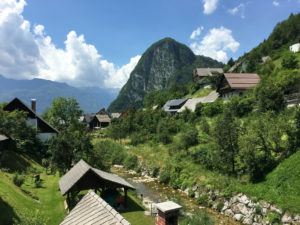 Another route to take is to stay at the Bohinj ECO hotel which includes an indoor waterpark. This hotel is not far from the Ribčev Laz side and easily accessible to all the great activities in the area. 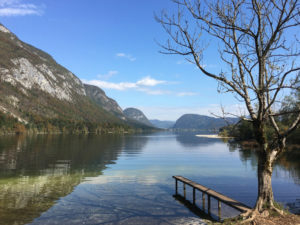 One final thing to keep in mind as you are planning a trip to Bohinj is that the weather can be unpredictable and often includes at least a short storm at some point in the day. However, the weather just adds to the drama of the beauty. Don’t let it deter you, especially if the forecast only calls for scattered storms so pack your bathing suit, your parka, and maybe a hat in case you head up to Vogel (which can be a little colder due to the elevation), and enjoy the beauty of Bohinj! anniewartanianreisinger on Welcome to Slovenia! Jan B. on Welcome to Slovenia! Enjoy this blog? Sign up for email updates and share!